I've been looking for a light summer dip that doesn't use mayo, and found an Eight Layer Mediterranean Dip on the Whole Foods Market site that inspired this recipe. You can add layers of cherry tomatoes, olives, etc., to suit your taste. I used tzatziki in this, but you can also use plain Greek Yogurt if you prefer. In a glass dish, spread hummus evenly in the bottom. Next, layer artichokes on top. 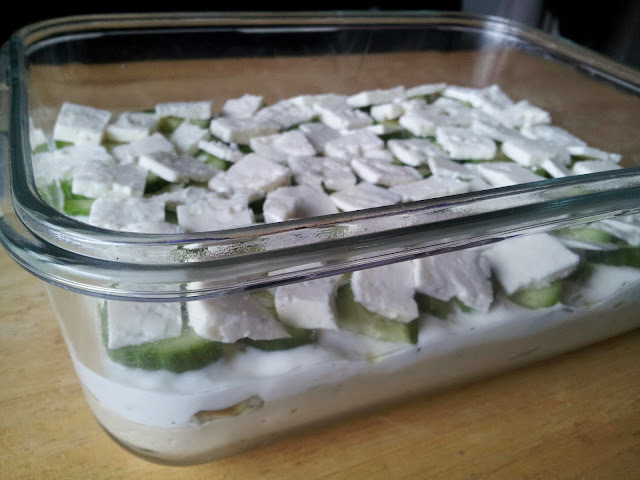 Spread tzatziki, followed by cucumbers and feta. Add black pepper as desired. Chill before serving.